Professional cleaning cloth for your firearm. Best results with or without the use of cleaning agents. High-quality and special lint-free microfibre structure guarantee best dirt-gripping properties and cleaning effects. Also perfect for polishing smooth surfaces. Whereas conventional cotton cloths have a very limited dirt-gripping capacity, are often not resistant to cleaning agents and tend to lint, SchleTek´s Microfibre Cloth Gun-Tuning-Team Black is the reliable and durable alternative of highest-quality workmanship. 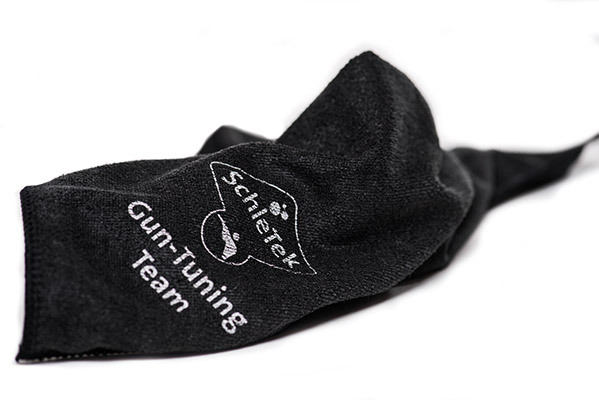 The Microfibre Cloth Gun-Tuning-Team Black is silicone-free and features a double-stitched edge protection with additional quality edge binding. Because of the special structure, the high density of microfibres (280 g/m²), and the optimal material composition of 80% polyester and 20% polyamide, it picks up and holds on to dry, wet or oily substances, exhibiting superior dirt-gripping and water-absorption properties. On most surfaces it mechanically removes the majority of dirt quickly, residue-free, yet gently, even without the use of additional chemical cleaning agents. An optimum cleaning effect will be achieved with the dry or slightly damp cloth. The Microfibre Cloth Gun-Tuning-Team Black is machine-washable up to 95°C (203°F) and dryer-proof.